A week ago, the gazebo in Coeur d’Alene Park in Browne’s Addition reopened to the public after a summer of construction work. The chain-link fence came down and a ribbon-cutting ceremony formally marked the occasion. The project replaces most parts of the previous gazebo, built in 1990 for $90,000 — equivalent to about $161,000 today because of inflation. 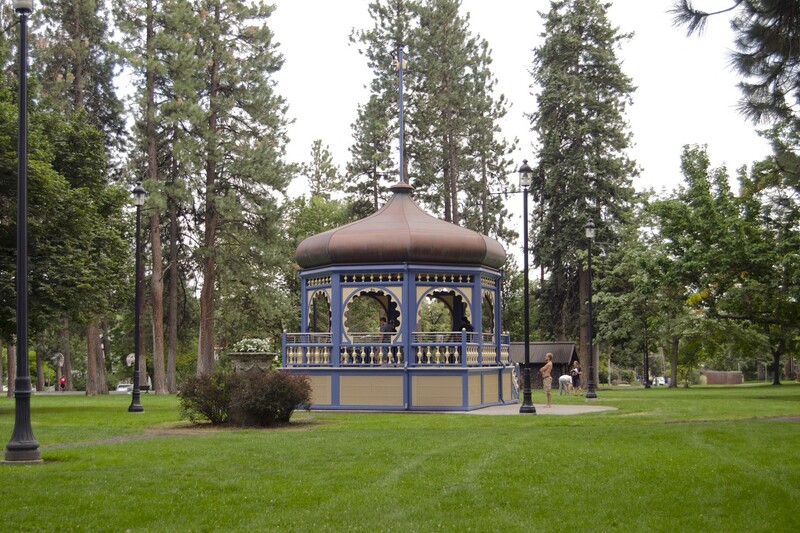 It was a wooden replica of the original bandstand built a century ago at the center of Spokane’s oldest public park. The gazebo — or pavilion, as it’s called in the project plans — was in bad shape before the restoration. Weather and vandals had damaged the structure in the two decades since it was built. Rusty bolts protruded from repaired joints, and paint was flaking from disintegrating wooden beams. It leaned to the west, in danger of collapsing. 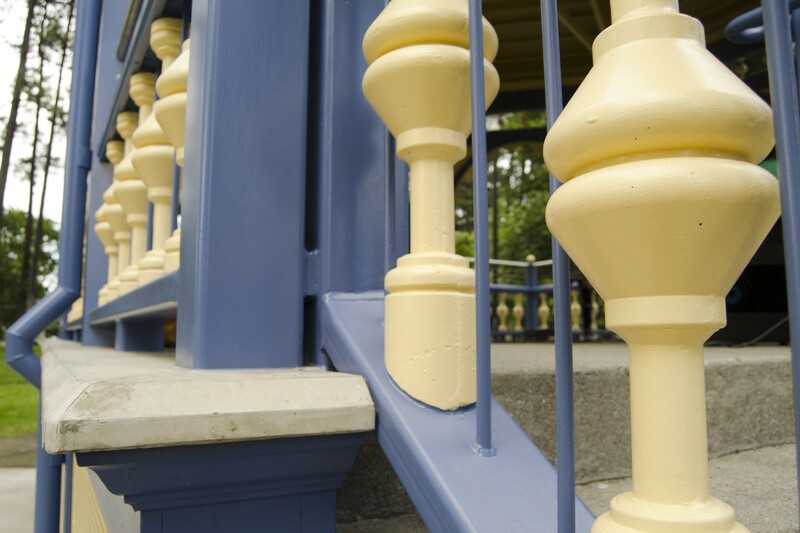 The project replaces rotting wood with steel and concrete, painted blue and yellow to match hand-tinted photographs of the original gazebo. The domed roof and concrete steps were salvaged. The total cost, from design to construction, was $196,403.28. During construction, some residents of the neighborhood questioned why a small structure with no plumbing or walls would cost as much as a small house. It’s hard to find an appropriate cost comparison, because the gazebo is a one-of-a-kind historic replica. Christine H. White, the Browne’s Addition resident who spearheaded the project, says she has been calling it the “big little project” because it was unusually expensive and complicated for the size of the structure. “Like myself, I think many people don’t realize the cost of construction and reconstruction,” she says. Construction costs encompass work by a number of subcontractors, which aren’t itemized in the final cost. The initial bid from EaglePointe Construction and Management doesn’t necessary represent the final costs, but gives an idea of the half-dozen subcontractors needed for landscaping, painting, masonry, electrical work and more. The largest amount in the bid was budgeted for steel fabrication. No, White says, she just wanted to pass on some information about the project. This was the goal — to see it being used and appreciated.